Canal with pathways on either side. 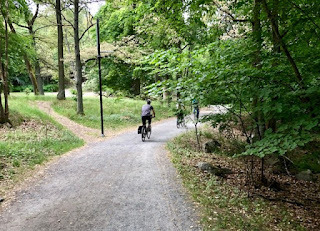 Did you know that 95% of the population of Stockholm live within 300 meters of a green area (park, forest, etc.)? 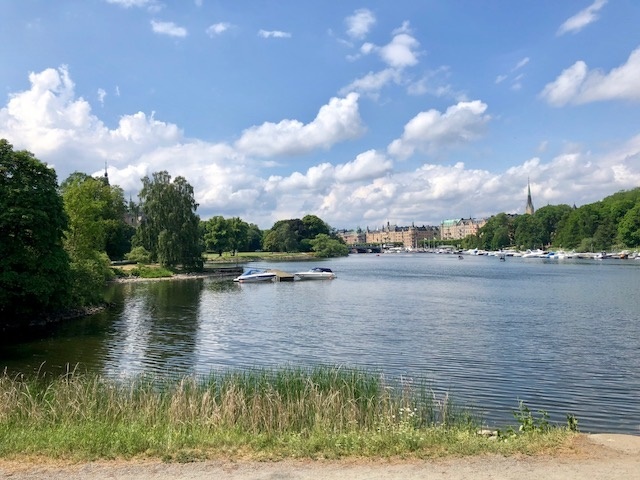 More statistics... the city has 1,000 parks, 7 nature reserves, 24 official beaches and 10% of the surface area of Stockholm is water (source). This means that, even though you are visiting a major urban area, you can easily get out and enjoy some nature while in Stockholm. 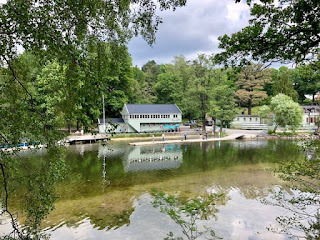 One of the easiest ways to do this is to visit the island of Djurgården in central Stockholm, which is part of the world's first National City Park. 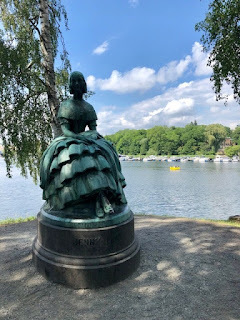 Now, chances are you will find yourself on Djurgården at some point during your visit as many of Stockholm's most popular attractions are found on the western edge of the park/island... like the Vasa Museum, Gröna Lund, Skansen and ABBA the Museum. 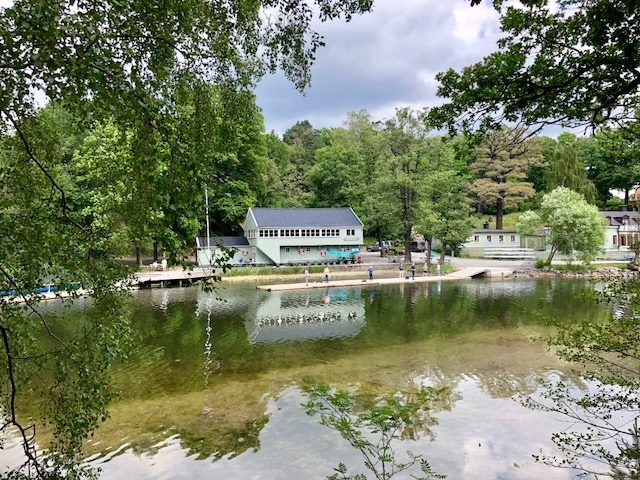 Unfortunately, many visitors miss the fact that there are acres and acres of forest, park, waterways and fields beyond the museums which they can enjoy. Besides that you also have several smaller art museums, cafés, gardens and restaurants tucked away in the park and off the beaten path. This park is a favorite place for Stockholmers to come to spend part of a summer day to partake in some outdoor activities... walking, jogging, biking or paddling. Or even less strenuous activities like just enjoying a picnic. 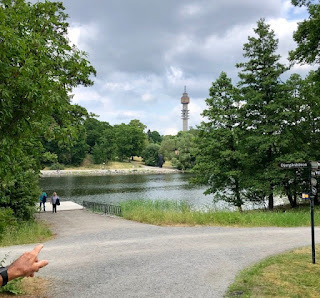 My parents are visiting me right now and I took them for a walk on Djurgården the other day to enjoy the beautiful nature. 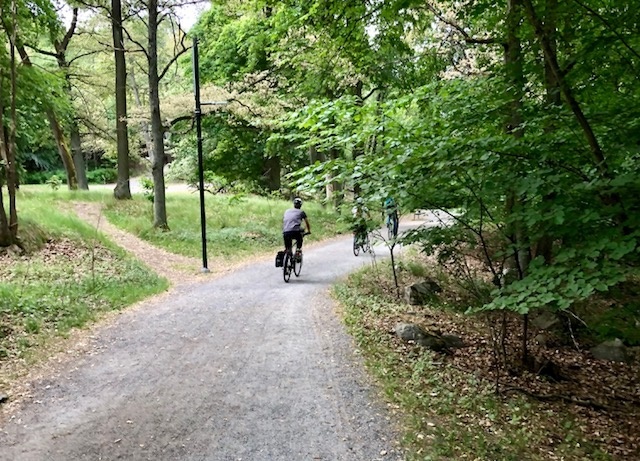 There are several options for trails or walking routes. 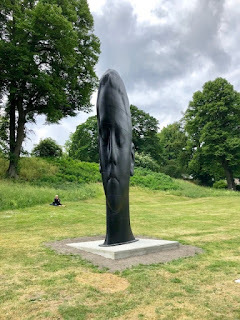 For example, one of my favorites is to take bus #69 out to its final stop, Blockhusudden, on the very eastern tip of Djurgården and then walk back along the coast to the city. I even blogged about it here a few years ago. But on this day we didn't have enough time for that walk, so we chose a shorter route around the canal separating the island from the mainland. This is the same canal the popular Royal Canal Tour travels through. 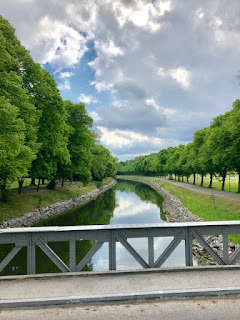 With bridges on both ends of the canal, you can actually walk the whole circular route around the canal... 5 or 7 kilometers, depending on what bridge you choose to cross. You can even chose a shorter/different route by taking the same bus #69 out to the stop Djurgårdsbrunn and then walk back along the canal. If you do this, make sure you take the bus 69 marked "Blockhusudden" and not "Kaknästornet" (which doesn't go all the way). It is an easy walk and well marked. It is a good idea to bring water if it is a hot day. Otherwise there are some cafés and restaurants along the way. For example at Djurgårdsbrunn. 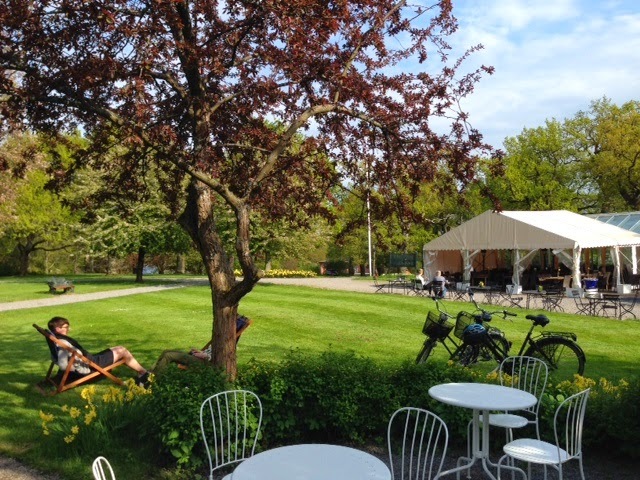 We opted to stop for lunch at one of my favorite places: Rosendals Wärdshus (location). Delicious shrimp sandwiches and rosé wine in the sun! 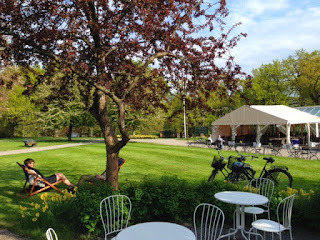 Blog article about Rosendal. 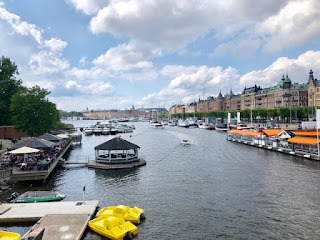 The easiest way to get to Djurgård island from the Hotel Rival is by taking the Djurgård Ferry from nearby Gamla Stan which takes you across the harbor to the island. 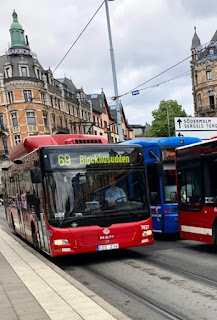 If you are interested in taking bus #69, as mentioned above, then the best place to pick that up is at Nybroplan. 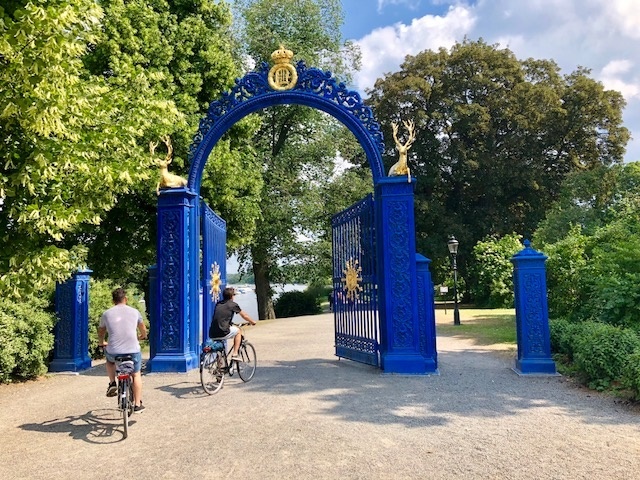 A good place to rent bikes on Djurgården is at Sjöcaféet, which is next to the Djurgården tourist office where you can get maps and more information about the park. So, take advantage of all of the green areas in Stockholm and get out and enjoy some fresh air and sunshine. .
Map with canal marked, click to enlarge.